1970 "Fear"book of Famous Monsters in mint condition. 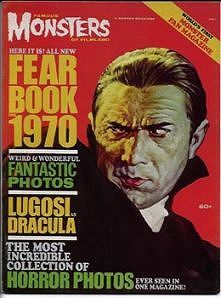 Features great cover painting of Lugosi as Dracula and articles and photos from past issues. This issue has one of the best covers I've seen. I'd love to own the original! Website design and hosting by Sohodojo Business Services. Item 166 of 466 items displayed in viewer. 0 items in cart.